The A.V. 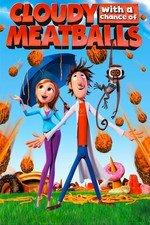 Club's review (Keith Phipps): "Freely adapted from the 1978 children’s book by Judi and Ron Barrett, the new animated movie Cloudy With A Chance Of Meatballs feels like a warning from another era. A parable about the perils of living amid abundance, it arrives at a moment when even Sesame Street has had to address the seemingly endless economic recession. Hey, message already received, the hard way. Of course, kids probably won’t mind. And if they’re lucky, they may even get a chance to appreciate its warning about the dark side of easy living." Dan Kois' review for The Washington Post notes the tone of the comedy: "It's true that any movie that crams so many jokes into its brief running time risks making audiences feel as overstuffed as if they'd just eaten a school-size pancake. That's why it's a lucky thing that so many jokes are so great: 'Cloudy With a Chance' has less in common with 'Shrek' than it does with gleefully absurdist comedies like TV's 'Arrested Development.' Instead of depending on a litany of pop-culture gags to score cheap laughs, writer-directors Phil Lord and Chris Miller populate the island of Swallow Falls – so little that on maps it's hidden behind the 'A' in 'Atlantic Ocean' – with appealingly wacky characters, and let them loose in surprising ways." Roger Ebert comments on the 3-D: “Cloudy With a Chance of Meatballs” is the first outing for new Sony digital 3-D imaging software. I continue to find 3-D a distracting nuisance, but it must be said the Sony process produces a sharp, crisp picture, with no visible imprecision between the matches of the images. There is clear definition between closer and further elements. I've seen a lot of 3-D recently, and in terms of technical quality, this is the best." This was a surprisingly fun movie. Before I saw it, I hadn't heard of the book, and the art style did not look good, so I went it with low expectations. It's interesting because this movie teeters on the edge of turning bad, but then keeps saving itself by ratcheting up the goofiness and absurdity. For example the date Flint takes Sam on has the marks of a terrible wince-inducing setup that a more serious movie like Brave or Ratatouille would drag the viewer through, but instead we get a fun jello castle date. The end result is a movie that's more watchable, and just better than those other two. They seem to wear their character arcs like albatrosses, making only token displays of being fun and wild, keeping those parts constrained and compartmentalized. I think Lord and Miller rediscovered how to mix fun in with the plot, something a lot of Hollywood apparently forgot. I was among the many people who went, "How could you possibly make a good movie out of that book?" I didn't know who'd written and directed it until it was mentioned in announcements that Phil Lord and Christopher Miller were doing the Lego Movie. I didn't quite drop what I was doing and watch it, but it wasn't far off. And I loved it! Kind of a lot! I will at this point, and have felt this way for a while, that I'd follow Phil Lord and Christopher Miller into Hell. That they weren't really involved in the sequel explains everything I've read about the drop in quality. In the sequel's defense, it is still pretty good, just not as amazing as the original; it is a Toy Story to Toy Story 2 drop-off, rather than a Monsters Inc. to Monster U. drop off. It is incredible that something so good was made from the book, because the book is funny, but there's about five minutes of content to it. Or a 21 Jump Street to 22 Jump Street falloff? 22 Jump Street was another one of Hollywood's sequel attempts to recatch the first's lightning in a bottle. See also The Hangover. I think Cloudy with a Chance of Meatballs is a great movie and the sequel is more worthy than say, Dispicable Me 2. This movie made me laugh out loud many times, the animation palette is gorgeous, characterizations wonderfully formed and they actually make me *feel*, and it's full of eccentric townsfolk. THE MONKEY STEVE. I just love this, it's definitely in my top ten animated films because of the humor and it flies the freak flag so hard - and proudly. Well done on this adaptation.